Which Hardscapes Are Best for Those Looking to Resell Their Homes? Landscaping is no longer just about trees, flowers, and foliage. 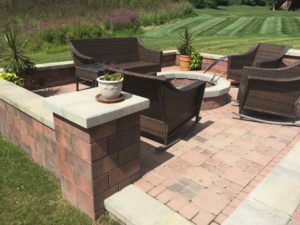 Well-planned hardscapes that extend indoor living spaces outdoors are extremely popular additions that add value to your Ann Arbor MI home. They should be an important part of your landscape planning. According to a study conducted jointly by the University of Michigan and Clemson University, potential buyers estimate the value of well-landscaped homes to be up to 11.3 percent higher than their actual base price. Bob Villa, former host of This Old House, refers to studies that find that the first impression created by a well-planned and executed landscape design can increase the value of an Ann Arbor MI home by as much as 20 percent. That equals the value added by remodeling your kitchen or bath, two investments that are standard recommendations. For that reason, the American Society of Landscape Architects (ASLA) recommends investing 10 percent of your home’s value in improving and maintaining your home’s landscaping. A covered patio or deck allows you to use the area even when it rains. You can maintain the open to the sky look and add color by covering a portion of your deck with a pergola and canvas panel inserts. For an even more open look, try canvas sails. A screened in area allows you and your guests to escape mosquitoes at dusk while still enjoying your evening. If you want privacy, you can install blinds or even curtains in outdoor fabrics. A fire pit lets you entertain your guests outdoors, even when Michigan’s fall weather turns days and nights chilly. A patio requires flooring material, but why have a plain, boring floor when you could have designs created by bricks placed to form geometric designs with borders or patterns created with paving stones of different colors. For more versatility, concrete can be stamped and tinted to mimic many natural materials. Some hardscaping ideas add value to your home but don’t earn quite as much return for the investment. Before committing to these projects, consider how much you, your family, and friends will enjoy them. Pools and outdoor kitchens and fireplaces represent substantial cash investments. If you, your family, and your friends will use them only occasionally, you may want to consider a smaller kitchen and a larger fire pit instead of a fireplace. However, if you foresee that these additions will be sources of a great deal of fun and entertainment, then, by all means, indulge. Above all, choose what you enjoy.